The conventions around what a wedding should look like are changing rapidly, and, thankfully, tired traditions are being pushed aside in the face of both creativity and imagination. People are looking to create a wedding experience that captures who they truly are, and a big part of that is finding the right venue or experience to accommodate your vision. Certainly, there’s nothing wrong with wanting to have a classic Ontario wedding, one that, perhaps, might look very much like your parent’s own special day. That being said, there’s never been more room to experiment with what your day can look like because the possibilities, quite simply, are endless. However your wedding day unfolds, it will surely be a day you’ll never forget, but what if you planned an event that ensured that it was a day that every single person who attended would never forget? The big day is yours and yours only, so you ought to do things your way, but it’s hard to know what that looks like in practice. Luckily, there are a variety of vendors who are catering experiences that are outside of the norm, but might just be your cup of tea. And maybe, just maybe, you’ll want to take a sip. The historic Sherwood Inn has hosted the who’s who of Canada’s citizens over the years, but now they’re looking open their ever exclusive doors just a little bit. The Sherwood Inn is now offering four lucky couples the chance to celebrate their new love for one memorable day in October. They want you to celebrate your sprouting affection, among their ancient trees lining the shores. Sherwood Inn Pop Up Wedding – Click here to read the poster. This famous 49 room inn near Port Carling, on a quiet bay of Lake Joseph, is looking to be a little unconventional and, as such, they’re offering a low flat fee package which includes a two night stay in the Premium Maplewood Room, a photo session with a local photographer, an experienced officiant to perform the ceremony, a floral bouquet, and access to resort amenities. Sherwood Inn wants to offer the exclusive setting without the exclusive price-tag. It’s all happening for these four lucky couples October 4th, so don’t hesitate to contact them if Lake Joseph is calling your name. Canadian history buffs rejoice – when it comes to weddings, it turns out you’ve got options. If the stresses of modern times have got you fed up, why not go back in time just a little? Discovery Harbour, a beautiful, historic site on Penetanguishene Bay, has recreated a site of crucial importance to the British naval war efforts both before, during, and after the War of 1812. You can utilize the recreated military and naval bases, as well as the lovely Captain Roberts’ Table Restaurant and King’s Wharf Theatre to plan a wedding unlike any other. If the 19th century just isn’t far enough back, don’t fret, there’s something for you as well in the form of Sainte-Marie among the Hurons. Sainte Marie among the Hurons was actually Ontario’s first European settlement, and was the headquarters of a French Jesuit mission beginning in the early to mid 17th century. The settlement lasted just ten years, but, at one point, it was home to about twenty percent of New France’s population. Now, Sainte-Marie among the Hurons has been recreated on its original site, right on the shores of Georgian Bay, and their nearby 3500 square foot hosting facility is ready and willing to host a celebration for the ages (note receptions only, ceremony must be off-site). 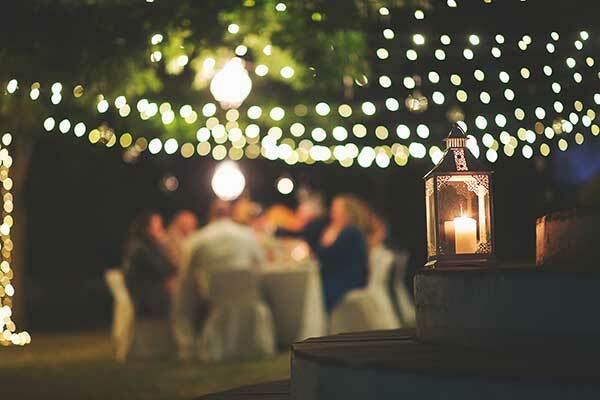 An outdoor forestral wedding chapel, a pavilion which can hold nearly 150 guests, and the opportunity for a campfire cookout, tractor-drawn wagon rides, and a whole lot more – that’s what is on offer at Rounds Ranch. Located in between Elmvale and Wasaga Beach, Rounds Ranch is looking to offer you something you can’t get anywhere else. They’re all about providing the rustic western setting that many people might have been dreaming of, but just didn’t know where to look. It’s a wedding venue that, should you book it, few are ever to forget, and, it’s unique enough that you likely don’t have to worry about folks trying to copy your style. Typically, couples head off on a cruise for their honeymoon, but what if you just couldn’t wait? If you’re looking for a smaller, more intimate style wedding cruise, Sunset Cruises, operating in Muskoka, might be your best bet. The Peerless II is a restored historic supply boat that’s ready to host you and roughly 50 others as you make your own piece of history. Not to mention, you’ll be putting through some awfully gorgeous scenery when you tie the knot. Whether you’re thinking about wedding venues, honeymoons, bachelorette parties, or bachelor parties, Ontario has got you covered when it comes to Ontario weddings, and you’ll be able to have your celebration your way. Especially in this case, these options aren’t for everyone, but that’s precisely the point. Weddings are expression of the love of two unique people and if any of the above options speak to said people, then that’s marvelous. Not everyone envisions themselves walking down the aisle of a relatively bland white church – some people want be on a ranch, to go back in time, be by a shore of ancient trees, or even out on the water. What’s marvelous is that you don’t have to fly halfway around the world to make your dream come true, you just have to embrace all that Ontario has to offer, in all its eccentricity. So, make a statement, have some fun, and build out a day that will live on in the mind’s of your guests for a long, long time, and in your heart forever. Christopher Mitchell is Canadian travel writer, blogger, photographer and podcaster. He’s visited nearly 80 countries, and lived on 4 continents, but his focus now is on what makes Canada, and specifically Ontario, special. He’s been published both nationally internationally and writes regularly on his blog, www.travelingmitch.com. You can also find him on social media on any platform at @travelingmitch. Posted in Events & Festivals, Places and tagged weddings. Get the latest events happening north of Toronto sent right to your inbox. Find out about the best getaway packages and experiences. Be the first to know about exclusive 400eleven getaway contests.